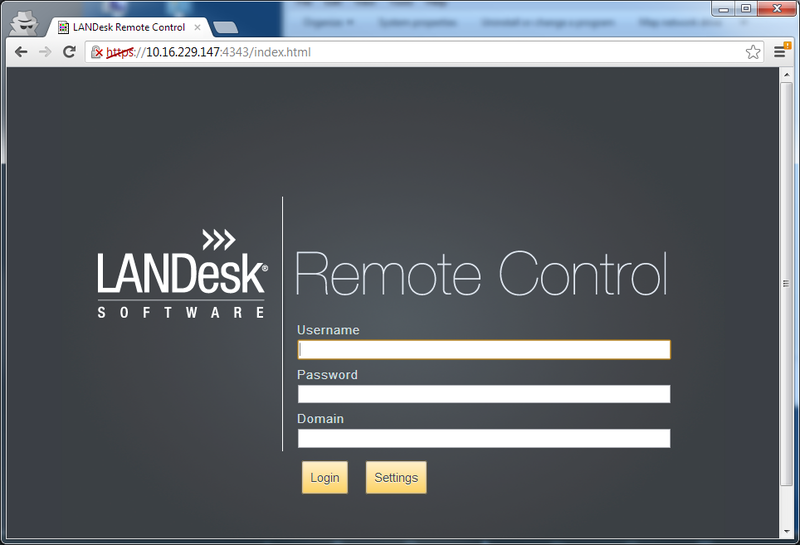 You can launch HTML remote control from the Endpoint Manager Windows console or directly from a browser. Right-click a device and click HTML remote control. NOTE: The URL uses https:// and not http://. When you manually launch remote control from a browser, you will need to provide domain credentials for a user authorized to use remote control. Keyboard: Toggles the on-screen keyboard that you can use to press keys that your browser can't normally pass to the remote computer. The ctrl, alt, and shift (up arrow) keys are sticky, and will stay down until you click the key again. On a Macintosh device, the Command key is also sticky. Screenshot: Creates a screenshot and allows you to save the image. Monitors: If the remote computer has multiple monitors, this button lets you choose which monitor you want to see. The monitor thumbnails show what was on each monitor when the session started. For more information, see Controlling devices that have multiple monitors with HTML remote control. Remote Execute: Enter a file name or click Browse... to locate a file to execute, then click Run. File Transfer: Enter the Remote Machine name and browse to the file by selecting a drive from the list. Restart: Enter the notification timeout in seconds and a message for the user and then specify whether to shut down or restart the computer. Enter a reconnect timeout in minutes, and then click Restart. Chat: Click Start Chat to begin the chat session. Clipboard: Displays text and files that have been in the remote device's clipboard during the current session. You can use this to copy remote text and files to your local device. For more information, see Using the HTML remote control clipboard to transfer text and files. Settings: Displays the Settings dialog. For more information, see Configuring HTML remote control settings. Zoom: Toggles zoom mode. When zoomed out, the viewer scales the remote session to fit in your browser's window. If the window size is too small, the scaled session text and other session elements may be hard to see. When zoomed in, scroll bars appear that you can use to see session parts that don't fit in the window. Exit: Exits the remote control session and returns to the login screen. NOTE: Currently, File Transfer, Clipboard, Drag and Drop and Chat are not supported on Macintosh devices.